Dublin's Cormac Costello with Ross Timothy of Roscommon. Dublin’s Cormac Costello says he has no problem playing whatever role Jim Gavin gives within the All-Ireland champions’ squad. 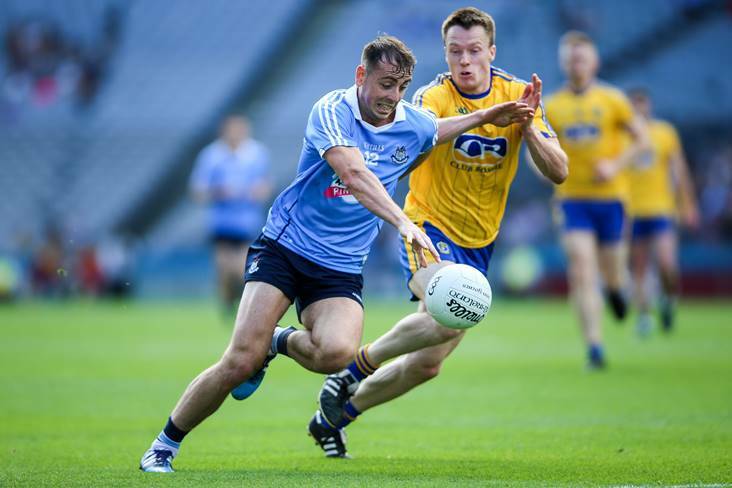 Costello has started just two of 17 championship games over the past six seasons under Gavin, coming on as a 52nd minute substitute for Niall Scully in last month’s All-Ireland SFC final victory over Tyrone after kicking 0-3 in the semi-final win against Galway. "Every footballer wants to play as much football as he possibly can. So that would be the aim. But if it's not to be, it's not to be. If I've some other role with the team and if I can push the team over the line, I'll gladly do it," Costello told the Irish Independent. "It's a special group of players. It's an honour to be involved with them in any capacity. There's different roles for different guys on the team. Some lads play more than others. "Some lads don't get the chance at all. It's just a privilege to put on that jersey and represent Dublin in some way and influence the team, just a privilege to get more time this year. "Everyone has their own role and their job to play. Even if they don't get on at all, it's about driving lads on in training or whatever it is. Everyone has their own individual role which I think pushed us over the line."